New Delhi: Literature festivals used to be a niche pursuit—quiet little getaways where authors could meet some of their more ardent readers. No longer. 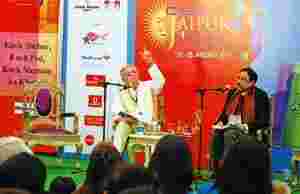 The Jaipur Literature Festival in January, India’s biggest such event, saw nearly 100,000 visitors over five days. With more people attending such events, publishing companies are seeing them as brand-building platforms, reason enough for the corporate sector to show greater interest. The indefinite postponement of Harud—The Autumn Festival of Literature, which was scheduled to be held in Srinagar this month, was an exception and more to do with politics than anything else. The Hindu’s festival, Lit for Life, will be held in Delhi and Chennai for a day each in September and October, respectively, with 50-60 delegates, including authors and guests. BCCL’s Mumbai Fully Booked: TOI Literary Carnival will be held at the city’s Mehboob Studios on 2-4 December. These additions will join other such events, many of them in their second year. The next four months will see at least 10 major literary festivals across the country, including the Indian edition of the Hay Festival of Literature and the Arts (Kerala), the Bookaroo Children’s Literature Festival (Delhi), the Kovalam Literary Festival (Kerala), the Goa Arts and Literary Festival, and Literature Live! (Mumbai). Organizing such an event costs between ₹ 50 lakh and ₹ 5 crore, according to organizers. The cost increases 15-20% annually, said Sanjoy K. Roy, founder of Teamwork Productions Pvt. Ltd, which has been organizing cultural festivals for nearly two decades. Besides infrastructure, costs that rise continuously are travel, accommodation and security, he added. Roy has been involved with the Jaipur Literature Festival for the last five years. This year, it had about 200 authors from all over the world. “Each time we have to build capacity, have better facilities," he said. Mita Kapur, chief executive of Siyahi, a Jaipur-based literary consultancy that also organizes literature festivals, said she has been getting more queries than ever to organize such events not just in India, but abroad as well. Kapur, who organized the second edition of Mountain Echoes three months ago in Bhutan, is creative consultant for The Hindu’s literature festival in Delhi. The newspaper’s festival will build on the identity carved out by its 20-year-old Literary Review section, said Nirmala Lakshman, a director at Kasturi and Sons. Last year, it instituted a ₹ 5 lakh award for the best writing by authors of Indian origin that was won by Manu Joseph for Serious Men, published by HarperCollins Publishers India Pvt. Ltd.
“For us, it is a brand-building exercise, a way to engage and reach out to our readers in Delhi, where we already have an edition," said Lakshman. The festival will be held twice a year in both Delhi and Chennai. Participants this year are expected to include Vikram Seth, Rahul Bhattacharya, Mohammad Hanif, Mukul Kesavan and Shashi Tharoor. TOI’s fest will have 30-40 Indian and international writers, including Vikram Chandra, Patrick French, Sudhir Kakar, Basharat Peer and Mohsin Hamid. “We always want to reach out to communities; with a literature festival, we’ll reach out to a different set of people altogether," said Rahul Kansal, chief marketing officer at BCCL. He declined to give details on sponsors for the event. TOI is also a long-time sponsor of Mumbai’s Kala Ghoda Arts Festival, which includes a literature component. Author and film critic Anil Dharker, who curated a literary event in Mumbai last year, said the increase in the number of festivals reflected growing public interest. He began Literature Live! in Mumbai last year with an investment of ₹ 1 crore. With sponsors that included Tata Sons Ltd, Standard Chartered, Indian Hotels Co. Ltd and Air India Ltd, Dharker said he just about broke even. Currently finalizing sponsors for this year, Dharker said he sees interest from the banking sector in being associated with the brand. Besides this, publishers use such events to launch books, he added. A senior executive with a leading publishing firm said it wasn’t uncommon for publishers to pay organizers to have their authors speak at sessions. “We get a book stall at the festival, have reading sessions, even release books as part of sponsorship deals," said this executive, who didn’t want to be named. Such deals for publishers can range anywhere from ₹ 5-6 lakh, sometimes more, depending on the day, time slot and venue, she said. Realty companies and the hospitality industry are also seeking to be associated with literature festivals. DSC Ltd, a ₹ 1,000 crore construction company, has been involved with the Jaipur Literature Festival for the last five years. “The association with a literature festival is our way of contributing to and empowering society," said Manhad Narula, director at DSC. DSC launched the South Asian Literature Festival in London this year and also announced a $50,000 (around ₹ 23 lakh) cash prize for the best literary work from the region. Roy of Teamwork said literature festivals attract banks and other corporate entities because the platform exposes them to high networth individuals (HNIs) that they invariably want to target. “Given the credibility and the participants that grace these events, corporates will increasingly find festivals a good way to brand their company," he added. Hiranandani Infrastructure and Real Estate Co. Pvt. Ltd is the principal sponsor of The Hindu literary event, while Thrissur-based Catholic Syrian Bank is a co-sponsor for the Kovalam festival. The title sponsor for the Kovalam Literature Festival is Deccan Chronicle, the English daily published by Deccan Chronicle Holdings Ltd.
Allianz Cornhill Information Services, a unit of Allianz Insurance Plc., is sponsoring the Hay festival this year, and Aviva Life Insurance Co. India Ltd is sponsoring Bookaroo. The Hindustan Times, published by HT Media Ltd (also the publisher of Mint), competes with TOI and The Hindu in some markets.